The unstructured nature of this family register sampler, initialed “SS” and attributed to Sally Sacket (b. 1786), is typical of eighteenth-century examples. In contrast to the more organized genealogy samplers that appear after 1800, the text here is run together in continuous lines. 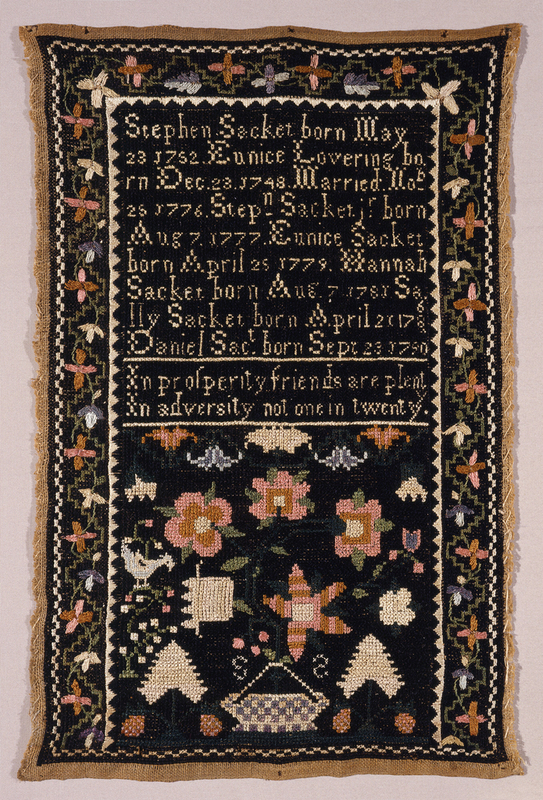 Sally’s sampler is one of a group of three Westfield, Massachusetts, examples that share similar characteristics. The Westfield samplers are small in size, vertical in design, and have a dark, solidly worked embroidered ground. They date from 1788 to 1796 and were made by girls between the ages of seven and eleven. No needlework instructress has been identified, but a Miss Lucy Mosley taught at a private school in Westfield in April 1799. It is possible that she may have been teaching in the area a few years earlier when Sally made her sampler. Sally Sacket was the youngest daughter of Stephen (1748-1830) and Eunice (about 1746-1830) Sacket of Westfield, Massachusetts. The couple’s other children were Stephen (b. 1777), Eunice (1779-1859), Hannah (b. 1781), and Daniel (1790-1823). Sally’s sampler refers to her mother as “Eunice Lovering,” but in Sacket family histories she is referred to as “Eunice Ross” or “Emma Eunice Ross.” Sally lists the birth years of her father and mother as 1752 and 1748, respectively. Stephen was actually born in 1748, however, and records from the First Church in Westfield state that Eunice was 83 when she died in 1830, indicating that she was born in 1746. Sampler, Massachusetts, USA, ca. 1796, embroidered by Sally Sacket (American, b.1786), silk embroidered in cross, satin and stem stitches on linen plain weave foundation, Bequest of Mrs. Henry E. Coe, 1941-69-46.